Tillya tepe, Tillia tepe or Tillā tapa (Persian: طلا تپه‎) or (literally "Golden Hill" or "Golden Mound") is an archaeological site in the northern Afghanistan province of Jowzjan near Sheberghan, excavated in 1978 by a Soviet-Afghan team led by the Greek-Russian archaeologist Viktor Sarianidi, a year before the Soviet invasion of Afghanistan. 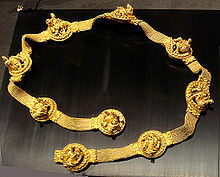 The hoard is often known as the Bactrian gold. The hoard is a collection of about 20,600 ornaments, coins and other kinds of artifacts, made of gold, silver, ivory etc., that were found in six burial mounds (five women and one man) with extremely rich jewelry, dated to around the 1st century BCE-1st century CE. The ornaments include necklaces set with semi-precious stones, belts, medallions and a crown. 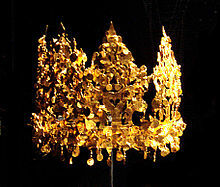 After its discovery, the hoard went missing during the wars in Afghanistan, until it was "rediscovered" and first brought to public attention again in 2003. A new museum in Kabul is being planned where the Bactrian gold will eventually be kept. The heavily fortified town of Yemshi-tepe, just five kilometres to the northeast of modern Sheberghan on the road to Akcha, is only half a kilometre from the now-famous necropolis of Tillia-tepe. Tillya Tepe is located in the Western portion of the region of ancient Bactria. A silver coin was found in one of the tombs from the reigns of the Parthian king Mithridates II, who ruled c. 123–88 BCE. The coin was found in tomb III, and was apparently held in the hand of the defunct woman. An imitation gold coin of Parthian King Gotarzes I (95-90 BCE) was found in the left hand of the defunct woman in tomb 6. The fact that this coin is in gold, and not silver or bronze as is usually the case for Parthian coinage, suggest that this imitation was made for prestige purposes. The coin is counterstamped with the frontal depiction of what might have been a local chieftain. The counterstamp was added so as to not damage the portrait of the Parthian king, perhaps indicating some degree of dependency on the Parthians. A gold coin was also found in tomb III showing the bust in profile of the wreath-crowned Roman Emperor Tiberius. On the reverse is an enthroned, sumptuously draped female figure holding a spray and scepter. Coins of this type were minted in the city of Lugdunum in Gaul, between 16 and 21 CE. A Buddhist gold coin from India was also found in tomb IV (the male warrior). On the reverse, it depicts a lion with a nandipada, with the Kharoshthi legend "Sih[o] vigatabhay[o]" ("The lion who dispelled fear"). On the obverse, an almost naked man only wearing an Hellenistic chlamys and a petasus hat (an iconography similar to that of Hermes/ Mercury) rolls a wheel. The legend in Kharoshthi reads "Dharmacakrapravata[ko]" ("The one who turned the Wheel of the Law"). It has been suggested that this may be an early representation of the Buddha. Finally, a very worn coin has been identified as belonging to the Yuezhi chieftain Heraios. It is thought that the site belonged to Sakas (Asian Scythians, who were later to migrate to India, where they are known as Indo-Scythians), although some suggest the Yuezhi (future Kushans) or eastern Parthians as an alternative. Several of the artifacts are highly consistent with a Scythian origin, such as the royal crown or the polylobed decorated daggers discovered in the tombs. Several of the defuncts exhibited ritual deformation of the skull, a practice which is well documented among Central Asian nomads of the period. Hellenistic tritons with dolphins (Tomb I.). These pieces have much in common with the famous Scythian gold artifacts recovered thousands of kilometers west on the banks of the Bosphorus and the Chersonese. A high cultural syncretism pervades the findings, however. Hellenistic cultural and artistic influences can be found in many of the forms and human depictions (from amorini to rings with the depiction of Athena and her name inscribed in Greek), attributable to the existence of the Seleucid empire and Greco-Bactrian Kingdom in the same area until around 140 BCE, and the continued existence of the Indo-Greek Kingdom in the northwestern Indian sub-continent until the beginning of our era. The artifacts were also intermixed with items coming from much farther, such as a few Chinese artifacts (especially Chinese bronze mirrors) as well as a few Indian ones (decorated ivory plates). This seems to be a testimony to the richness of cultural influences in the area of Bactria at that time. A ram figurine found in the hoard. Gold stater of the Greco-Bactrian king Eucratides, the largest gold coin of the Ancient World. The hoard was thought to have been lost at some point in the 1990s, the National Museum of Afghanistan having been looted numerous times resulting in a loss of 70% of the 100,000 objects on display. In 2003, however, it was found in secret vaults under the central bank building in Kabul. In 1989 following a committee decision, the last Communist president of Afghanistan, Mohammad Najibullah had ordered the hoard moved from the museum to an underground vault at the Central Bank of Afghanistan in Kabul. The doors of the vault were locked with keys which were distributed to five trusted individuals. In 2003, after the Taliban was deposed, the new government wanted to open the vault, but the keyholders (called "tawadars") could not be summoned because their names were purposefully unknown. Hamid Karzai had to issue a decree authorizing the attorney general to go ahead with safecracking. But in time, the five key-holders were successfully assembled and the vault opened. Since then, the National Geographic Society has catalogued the collection, which appears to be complete – 22,000 objects. Also witnessing the re-opening were National Geographic Explorer and Archaeology Fellow Fredrik Hiebert and the archaeologist who originally found the hoard, Viktor Sarianidi. Following an agreement between the Afghan government and France, the collection was evaluated and displayed internationally in an exhibition through the cooperation of several prominent museums and the National Geographic Society. Objects were on display from 2007-2009 variously at the Musée Guimet in Paris, the National Gallery of Art in Washington DC, the Asian Art Museum of San Francisco, the Museum of Fine Arts in Houston, and the Metropolitan Museum of Art in New York. Some of the most spectacular finds were a part of the traveling exhibition titled "Afghanistan: Hidden Treasures From the National Museum, Kabul" or "Afghanistan: Crossroads of the Ancient World" which were first on displayed in December 2006 in France’s Musee Guimet in Paris. The exhibition supported by The National Geographic has also been to the National Gallery of Art in Washington, D.C. from May 25 to Sept. 7th, 2008; from Oct. 24th, 2008 to Jan. 25th, 2009 the collection was at the Asian Art Museum of San Francisco; from February 22 to May 17, 2009 it traveled to The Museum of Fine Arts, Houston then to the Metropolitan Museum of Art, New York from June 23 to Sept. 20th, 2009; Canadian Museum of Civilization in Gatineau-Ottawa held the exhibition from October 23, 2009, to March 28, 2010; Bonn Museum in Germany from June 11, 2010 to January 2, 2011 and from March 3, 2011 to July 3, 2011 the British Museum in London. From July 26 to November 26, 2014 the exhibition shows at the Western Australian Museum in Perth and from May 17 to June 17, 2017 the Palace Museum in Beijing. The Museum of Oriental Art in Turin, Italy, and Nieuwe Kerk in Amsterdam also saw displays. Aphrodite and Eros. Tomb II, Tillia tepe. Amorini riding on fish, Tillia tepe. Tomb II. Rings from Tillia tepe; the left one represents a seated Athena. Tomb II. "Kings with dragons". Tomb II. Men in armor, in Greek fighting gear. Tomb III. "Akinakes" polylobed decorated daggers. Tomb IV. Dyonisos and Ariadne riding a lion. Tomb VI. Wikimedia Commons has media related to Tillya Tepe. ^ Srinivasan, Doris (2007). On the Cusp of an Era: Art in the Pre-Kuṣāṇa World. BRILL. p. 16. ISBN 9789004154513. ^ Sarianidi, Victor. 1985. The Golden Hoard of Bactria: From the Tillya-tepe Excavations in Northern Afghanistan. Harry N. Abrams, New York. ^ "Il semble qu'on ait là la plus ancienne représentation du Buddha, selon une modalité qui n'est pas encore celle de l'iconograhie boudhique traditionnelle" (French): "It seems this might be the earliest representation of the Buddha, in a style which is not yet that of traditional Buddhist iconography", in Afghanistan, les trésors retouvés, p. 280. ^ a b Lawson, Alastair (1 March 2011). "Afghan gold: How the country's heritage was saved". BBC. Retrieved 1 March 2011. ^ Fredrik Hiebert and Pierre Cambon, eds. Afghanistan: Hidden Treasures from the National Museum, Kabul. Washington DC: National Geographic, 2007. ^ Afghanistan: Hidden Treasures from the National Museum, Kabul (2008), pp. 18-19. Sarianidi, Victor. 1990–1992. "Tilya Tepe: The Burial of a Noble Warrior." PERSICA XIV, 1990–1992, pp. 103–130. "Afghanistan: Nation Protects Storied Bactrian Treasure", from Radio Free Europe, June 9, 2006 – provides an overview. Archaeological exploration of the pre-Islamic period of Afghanistan began in Afghanistan in earnest after World War II and proceeded until the late 1970s when the nation was invaded by the Soviet Union. Archaeologists and historians suggest that humans were living in Afghanistan at least 50,000 years ago, and that farming communities of the region were among the earliest in the world. Urbanized culture has existed in the land from between 3000 and 2000 BC. Artifacts typical of the Paleolithic, Mesolithic, Neolithic, Bronze, and Iron ages have been found inside Afghanistan. Bactria ; or Bactriana was a historical region in Central Asia. Bactria proper was north of the Hindu Kush mountain range and south of the Amu Darya river, covering the flat region that straddles modern-day Afghanistan, Tajikistan, Uzbekistan, and parts of Northern Pakistan. More broadly Bactria was the area north of the Hindu Kush, west of the Pamirs and south of the Tian Shan with the Amu Darya flowing west through the center. The Kushan Empire was a syncretic empire, formed by the Yuezhi, in the Bactrian territories in the early 1st century. It spread to encompass much of Afghanistan, and then the northern parts of the Indian subcontinent at least as far as Saketa and Sarnath near Varanasi (Benares), where inscriptions have been found dating to the era of the Kushan Emperor Kanishka the Great. Emperor Kanishka was a great patron of Buddhism. He played an important role in the establishment of Buddhism in the Indian subcontinent and its spread to Central Asia and China. A hoard or "wealth deposit" is an archaeological term for a collection of valuable objects or artifacts, sometimes purposely buried in the ground, in which case it is sometimes also known as a cache. This would usually be with the intention of later recovery by the hoarder; hoarders sometimes died or were unable to return for other reasons before retrieving the hoard, and these surviving hoards might then be uncovered much later by metal detector hobbyists, members of the public, and archaeologists. Eucratides I, sometimes called Eucratides the Great, was one of the most important Greco-Bactrian kings, descendants of dignitaries of Alexander the Great. He uprooted the Euthydemid dynasty of Greco-Bactrian kings and replaced it with his own lineage. He fought against the Indo-Greek kings, the easternmost Hellenistic rulers in northwestern India, temporarily holding territory as far as the Indus, until he was finally defeated and pushed back to Bactria. Eucratides had a vast and prestigious coinage, suggesting a rule of considerable importance. Ai-Khanoum, possibly the historical Alexandria on the Oxus, also possibly later named اروکرتیه or Eucratidia) was one of the primary cities of the Greco-Bactrian Kingdom. Previous scholars have argued that Ai Khanoum was founded in the late 4th century BC, following the conquests of Alexander the Great. Recent analysis now strongly suggests that the city was founded c. 280 BC by the Seleucid emperor, Antiochus I Soter. The city is located in Takhar Province, northern Afghanistan, at the confluence of the Panj River and the Kokcha River, both tributaries of the Amu Darya, historically known as the Oxus, and at the doorstep of the Indian subcontinent. The National Museum of Afghanistan, also known as the Kabul Museum, is a two-story building located 9 km southwest of the center of Kabul in Afghanistan. As of 2014, the museum is under major expansion according to international standards, with a larger size adjoining garden for visitors to relax and walk around. The museum was once considered to be one of the world's finest. Azes II would have been the last Scythian king in Gandhara, western Pakistan. His existence has been questioned — would he not have existed, artefacts attributed to his reign, such as coins, would likely be those Azes I.
Sheberghān or Shaburghān, also spelled Shebirghan and Shibarghan, is the capital city of the Jowzjan Province in northern Afghanistan. The Guimet Museum is an art museum located at 6, place d'Iéna in the 16th arrondissement of Paris, France. It has one of the largest collections abroad of Asian art. Mujatria, previously read Hajatria, is the name of an Indo-Scythian ruler, the son of Kharahostes as mentioned on his coins. The Peshawar Museum is a museum located in Peshawar, capital of Pakistan’s Khyber Pakhtunkhwa province. The Peshawar Museum is notable for its collection of Buddhist artwork dating from the ancient Gandhara Empire. A protome is a type of adornment that takes the form of the head and upper torso of either a human or an animal. Protomes were often used to decorate ancient Greek architecture, sculpture, and pottery. Chaman-i Hazouri or Hazoori Chaman is a park in downtown Kabul, Afghanistan. It is the site of the famous Chaman Hazouri hoard of ancient coins and jewellery dating back to the Achaemenid Empire, which is of key interest to the historians.